George Lansbury, the son of a railway contractor, was born in Haleworth, Suffolk, in 1859. When George was nine years old the family moved to East London. George started work in an office at the age of eleven but after a year he returned to school where he stayed until he was fourteen. This was followed by a succession of jobs as a clerk, a wholesale grocer and working in a coffee bar. Lansbury then started up his own business as a contractor working for the Great Eastern Railway. This was not a success and now married with three children, Lansbury decided in 1884 to emigrate to Australia. The Lansbury family found it difficult to settle in Australia and the following year returned to England and he began work at his father-in-law's timber merchants. Lansbury was angry about his time in Australia and believed that he had been a victim of untrue propaganda about the country. He came to the conclusion that the emigration authorities were disseminating false information in an effort to entice immigrants to Australia. He joined the campaign against this policy and in doing so obtained his first experience of politics. In the 1886 General Election Lansbury joined the local Liberal Party. Later that year he was elected General Secretary of the Bow & Bromley Liberal Association. However, Lansbury became disillusioned with the leadership's views on industrial issues and eventually left the party over its unwillingness to support legislation for a shorter working week. Lansbury joined the Gasworkers & General Labourers Union and in 1889 joined a local strike committee during the London Dockers' Strike of that year. These activities brought him into contact with H.M. Hyndman, the leader of the Social Democratic Federation. Although the two men disagreed with each other over many issues, Lansbury decided to join the party and in 1892 established a branch of the Social Democratic Federation in Bow. 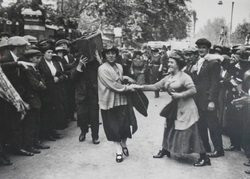 This marked the start of Lansbury's long campaign against poverty and unemployment in London. As a young man, Lansbury had been an atheist. However in the 1890s he was influenced by the religious ideas of people like Stuart Headlam and Philip Snowdon. Lansbury became a Christian Socialist and was later to play an important role in converting people such as James Keir Hardie to Christianity. In 1892 Lansbury was elected to the Board of Guardians that ran the Poplar Workhouse. Lansbury and his colleagues decided to use their power to change the system. Lansbury, unlike most Guardians, did not believe that the generous treatment of paupers would encourage more people to seek refuge in the workhouse. Over the next few years the Guardians dramatically improved the conditions in their workhouse. They also established a Laindon Farm Colony in the Essex countryside where they provided work for the unemployed and taught them the basics of market gardening. Lansbury continued to be a member of the Social Democratic Federation and in 1895 he became the party's candidate in a parliamentary election in Walworth. He only obtained 204 votes in that election but in 1900 he obtained 2,558 against the Conservative Party candidate who won with 4,403 votes. Lansbury found his relationship with H.M. Hyndman, increasing difficult. Lansbury disliked Hyndman's dictatorial method of running the party, he also disagreed with his Marxist views. Lansbury's socialism had been inspired by the teachings of Jesus Christ, whereas Hyndman was a devout follower of Karl Marx, an atheist. In 1903 Lansbury left the Social Democratic Federation and joined the Independent Labour Party, an organisation that contained a large number of Christian Socialists. Three years later the Independent Labour Party became the Labour Party, an organisation led by James Keir Hardie, a man who was converted to Christianity in 1897. In 1906 the government ordered an inquiry into the running of the Poplar Workhouse. The Board of Guardians were accused of wasting the ratepayers' money by their generous treatment of paupers and the funding of the Laindon Farm Colony. Lansbury, who had been joined as a Guardian by John Burns, another leading figure in the Christian Socialist movement, argued the case for treating people in workhouses with dignity. Although the government report was critical of the Guardians, they refused to change their policy and eventually the authorities decided not to take action against them. Lansbury was now one of the leading figures in the Labour Party and in the 1910 General Election was elected as the MP for Bow & Bromley. Lansbury, along with James Keir Hardie, led the campaign in Parliament for votes for women. Lansbury was especially critical of the Cat and Mouse Act and was ordered to leave the House of Commons after shaking his fist in the face of Herbert Asquith, the Prime Minister, and told him that he was "beneath contempt" because of his treatment of WSPU prisoners. Hardie and Lansbury had trouble persuading all Labour MPs to support votes for women. Many of them argued that the party should make sure all working class men had the vote before it concerned itself with the franchise for women. Others argued that a policy that advocated votes for women was unpopular with the electorate and would result in the Labour Party losing seats in the next General Election. 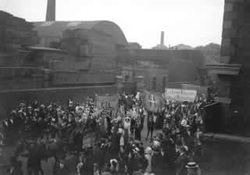 In October, 1912, Lansbury decided to draw attention to the plight of WSPU prisoners by resigning his seat in the House of Commons and fighting a by-election in favour of votes for women. Lansbury discovered that a large number of males were still opposed to equal rights for women and he was defeated by 731 votes. The following year he was imprisoned for making speeches in favour of suffragettes who were involved in illegal activities. While in Pentonville he went on hunger strike and was eventually released under the Cat and Mouse Act. For the next ten years Lansbury was out of the House of Commons and concentrated on journalism. 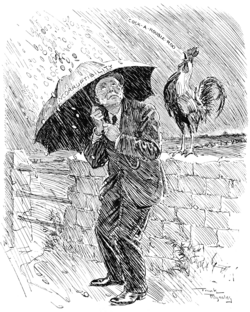 In 1911 he helped start the Daily Herald and two years later became the editor of the newspaper, where he worked closely with the cartoonist Will Dyson and the journalist, Hillaire Belloc. Lansbury and his newspaper, the Daily Herald, was opposed to Britain involvement in the First World War. This made him unpopular during the nationalist fervour that developed between 1914 and 1918. In the 1918 General Election, Lansbury, like other anti-war Labour Party candidates was defeated. Lansbury was elected to the local council and in 1921 he became Mayor of Poplar. The council took the decision to increase the amount of money spent on poor relief. This brought the council in conflict with the British government and in 1921 Lansbury and the majority of the local council were imprisoned for over four months. 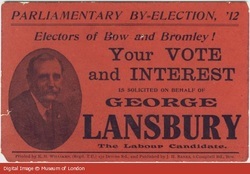 In the 1922 General Election Lansbury was elected as the Labour MP for Bow & Bromley with a majority of 7,000. Lansbury was unhappy with the way the Daily Herald became more conservative in its reporting after being taken over by the Labour Party and the TUC after 1923. In 1925 he started the Lansbury's Labour Weekly. The newspaper rapidly reached a circulation of 172,000 and provided an important source of news during the 1926 General Strike. Although his left-wing ideas made him unpopular with some of the leaders of the Labour Party, Lansbury was elected Chairman party in 1928. The following year he became Commissioner for Works in the Labour government led by Ramsay MacDonald. Lansbury refused to support MacDonald's measures in 1931 to deal with the economic crisis and resigned from office. When MacDonald formed a National Government, Lansbury became the leader of the Labour opposition. Lansbury hated fascism but as a pacifist he was opposed to using violence against it. When Italy invaded Abyssinia he refused to support the view that the League of Nations should use military force against Mussolini's army. After being criticised by several leading members of the Labour Party, Lansbury resigned as leader of the party. Lansbury spent the last few years of his life trying to prevent a Second World War. He travelling throughout Europe meeting the political leaders of the various countries. After having talks with Adolf Hitler he believed it was still possible to reach an agreement that would avoid a war. 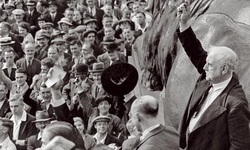 His efforts ended in failure and George Lansbury died a disillusioned man on 7th May, 1940.